Planning and Design Inc. engineers for both commercial and residential Photovoltaic (PV) system. This enables owners to generate some or all of their daily electrical energy demand on their own site, exchanging daytime excess power for future energy needs (i.e. nighttime usage). The stucture remains connected to the electric utility at all times, so any power needed above what the solar system can produce is simply drawn from the utility. PV systems can also include battery backup or uninterruptible power supply (UPS) capability to operate selected circuits for hours or days during a utility outage. Select a system that meets the owner's needs. Customer criteria may include reduction in monthly electricity bill, environmental benefits, desire for backup power, initial budget constraints, etc. 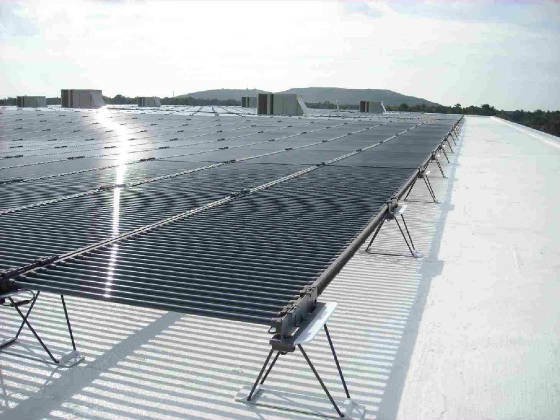 Size the PV array to provide the expected electrical power and energy. Ensure the roof area or other installation site is structurally capable of handling the desired system size. Based on the structural analysis we select a PV system and if required a rack system to support the modules. Locate the array to minimize shading from foliage, existing equipment, and adjacent structures. Design the system in compliance with all applicable building and electrical codes. Design the system with a minimum of electrical losses due to wiring, fuses, switches, and inverters. Properly house and manage the inverter, disconnects, and electrical panels. Ensure the design meets local utility interconnection requirements.